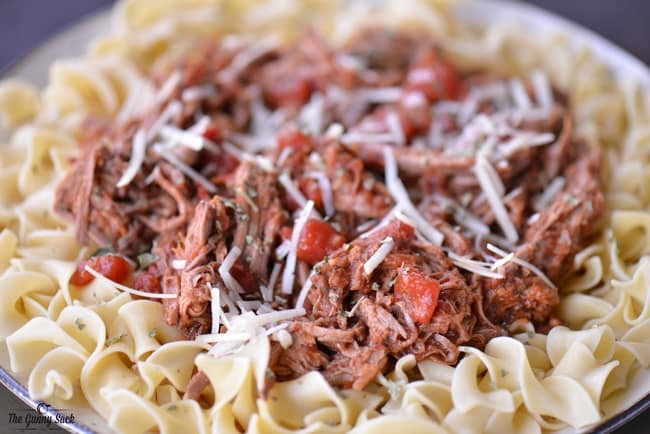 This Slow Cooker Italian Pot Roast is the ideal family dinner for busy days. Put it in the crock pot in the morning and dinner is ready when you want to eat! I’ve made traditional pot roasts and BBQ pot roasts for dinner and decided that I should make an Italian pot roast. I read somewhere, many years ago, that tomatoes help tenderize roast. Over the years, I’ve often placed slices of tomatoes on my roasts while they are cooking. 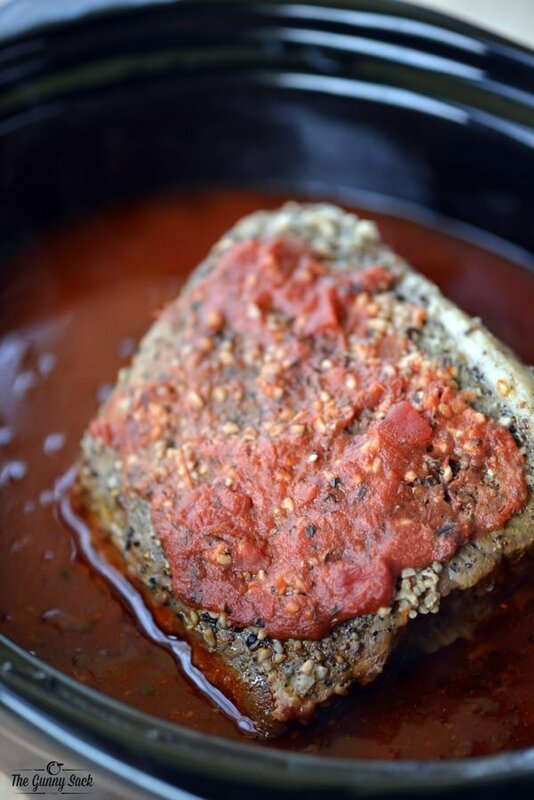 For this Slow Cooker Italian Pot Roast, I took it a step further and used a large jar of pasta sauce when cooking the roast. It turned out so tender and full of flavor! 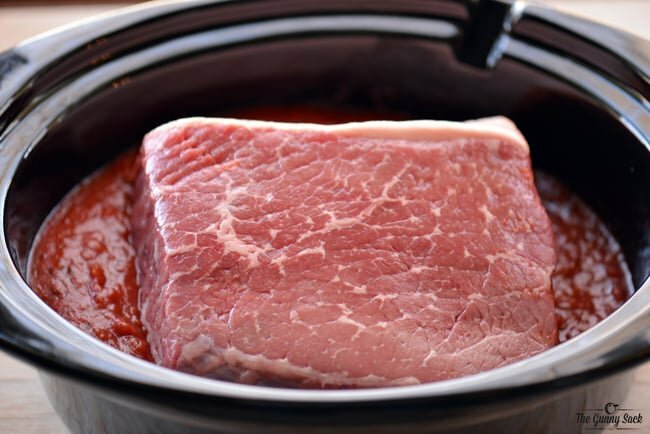 Making this slow cooker pot roast, couldn’t be easier! 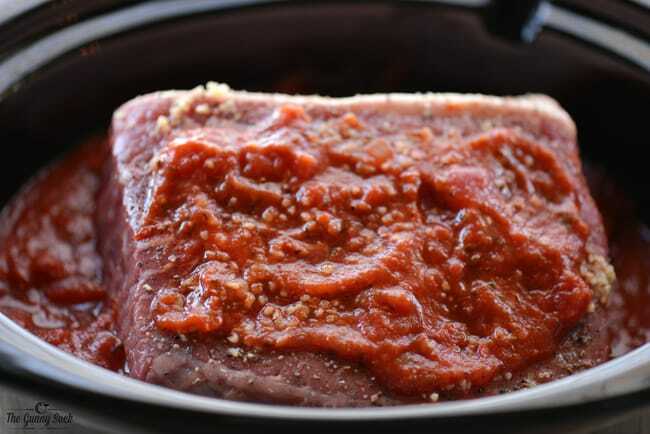 Pour one jar of pasta sauce into the crock pot. I used fire roasted tomato and garlic sauce and my 6 quart Crock Pot. Add the roast (mine was a bottom round roast). 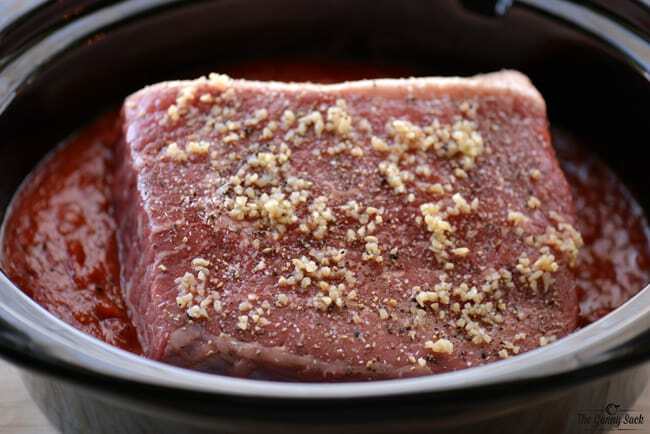 Sprinkle the roast with salt, pepper and garlic and top with a few tablespoons of the pasta sauce. If your family is more adventurous than mine is, you could add some sliced tomatoes, onions and peppers to the sauce. They would be a delicious addition to the pasta. Cook the roast on low for 7-8 hours, until tender. Once the roast is done cooking, it’s time to cut or shred the roast. I used two forks to shred it. Return the roast to the sauce in the slow cooker, stir and it’s ready to serve. 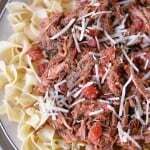 Boil some pasta, top it with shredded roast beef and shredded cheese. If you like things on the saucy side, open another jar of sauce and spoon some onto your pasta. You can also use the sauce from the crock pot, but it is pretty thin because of all the juice from the roast. 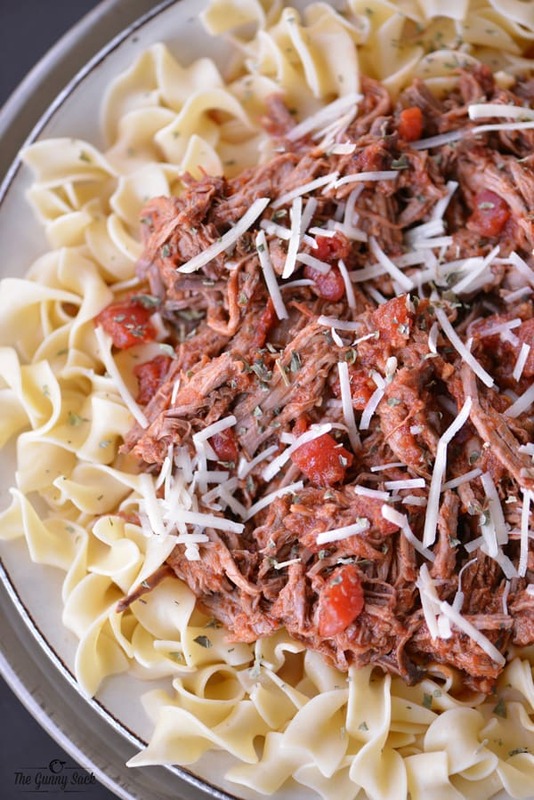 This Slow Cooker Italian Pot Roast was so easy to make. It was full of flavor and is the ideal family dinner for busy days. Put it in the crock pot in the morning and dinner is ready when you want to eat! Add the roast. Sprinkle with salt, pepper and garlic and top with a few tablespoons of the pasta sauce. Cover and cook the roast on low for 7-8 hours, until tender. Once the roast is done cooking, slice or shred the roast. I used two forks to shred it. Return the roast to the sauce in the slow cooker, stir and enjoy. Optional ingredients: Add sliced tomatoes, onions and peppers to the crock pot before cooking. Serving suggestions: Serve the Italian pot roast over mashed potatoes, pasta or in a sub sandwich. Very tasty roast, good over Amish noodles or palatable. Just wanted to say the recipe was a great success…my fiancé and her daughter loved it! I like recipes with a little kick so I added a couple of finely chopped jalapeños(with seeds) & the girls/myself thought it turned out great…GREAT RECIPE! Love the addition of jalapenos! I’ll have to try that next time. Thanks Mark! This looks like a crock pot win! Thank you! Thank you Tonia for the nice recipe and have a great weekend. 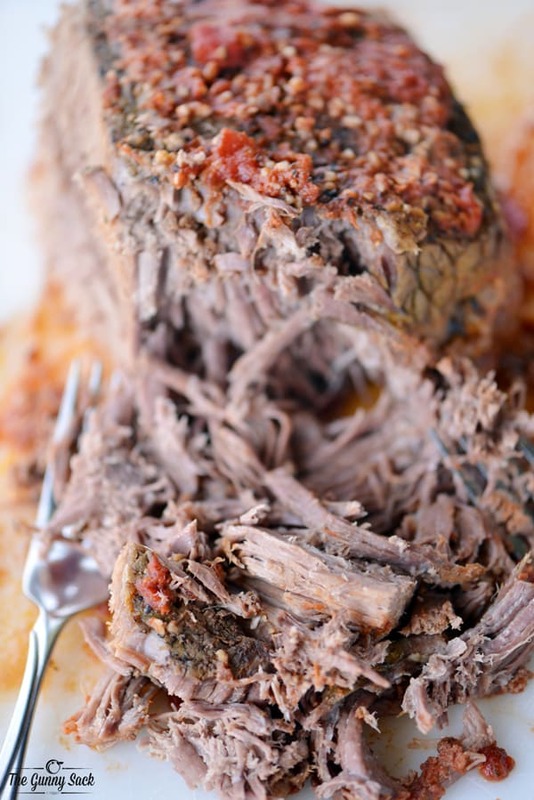 I can’t wait to try your Italian pot roast – we’ve been on a kick trying new roast recipes and this one definitely looks like a keeper!